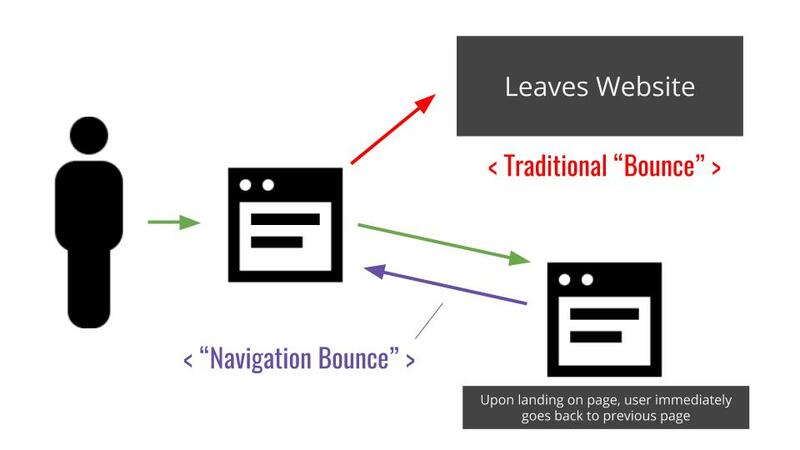 Do Navigation Bounces Affect SEO & Digital Revenue? In the world of digital publishing, providing your website visitors with a better experience is a formulaic tool in improving digital revenue, growing organic website traffic, and enhancing the brand perception of your digital property. 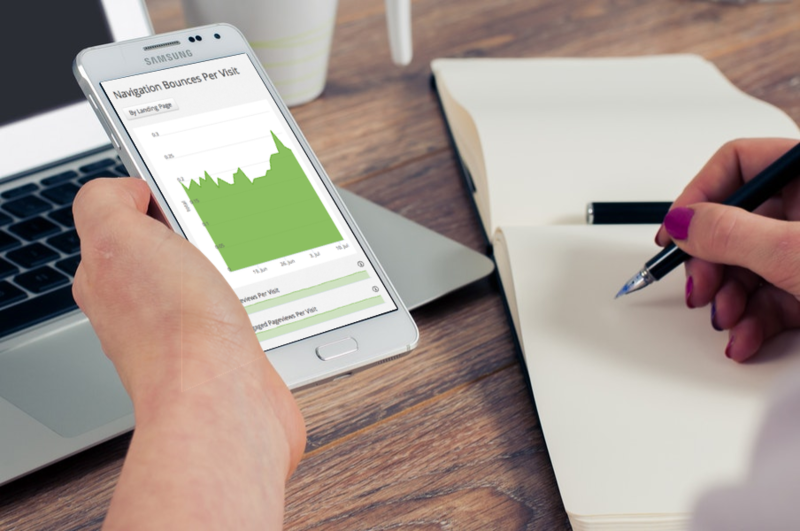 The measurement and metrics associated with user experience have a proven and recognized correlation with everything from session revenue to search engine ranking position. Recently, we have started taking a deeper look into these metrics — and increasing our focus on what we would call “intent” metrics. More specifically, this week we’re taking a closer look at Navigation Bounces. In the research below, we’ll highlight what navigation bounces are, how we measure them, how you can measure them, and the impact that we’ve studied them having on SEO, digital revenue, and overall user experiences. What is a navigation bounce? Navigation bounces are similar to a regular bounce where it tracks a user exiting quickly, but takes a more internally targeted approach. 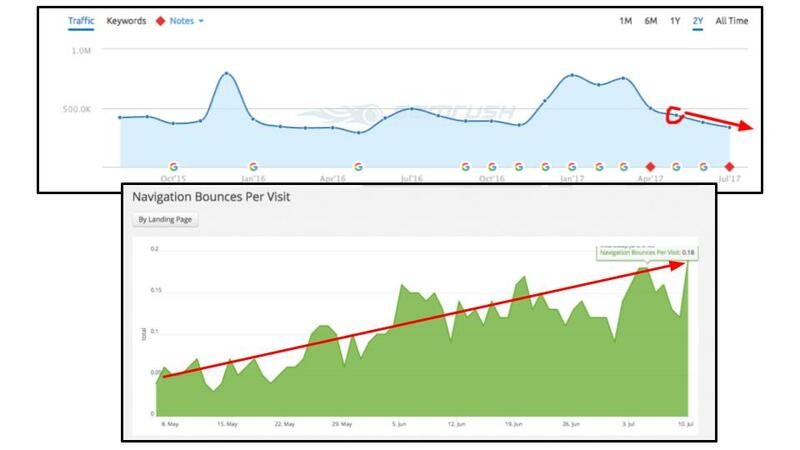 A navigation bounce tracks internal bounces over different pageviews. It looks at pageviews during a user session in which a user may go to the next page; only to quickly exit the site or navigate quickly to another page. Example: Say we have 3 pageviews divided between two pages, page A and page B. pageview 1 is page A, pageview 2 is page B, and pageview 3 is page A again. The third pageview will be marked as a navigation bounce; as the user in this case clearly didn’t mean to go to page B (or quickly realized it wasn’t the page they wanted to view). 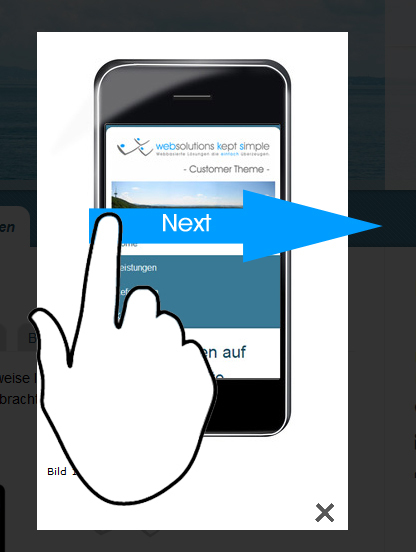 The figure above allows you to see the differences between a traditional bounce and a user navigation bounce. The principle difference is that a navigation bounce can help you better infer when a pageview may have been accidental, unwanted, or simply not the page user wanted to navigate to. So why should we event be looking at navigation bounces vs. good ole fashion bounce rates? The principle value in navigation bounces vs. traditional bounce rates is that navigation bounces give you a more granular look at user behavior and visitor intent (and have a more direct correlation to revenue and SEO as we’ll show below). Generally, bounce rates are giving you a very binary metric about something fairly complex. Did a visitor bounce, yes or no. The problem is, sometimes users don’t record bounces but still have negative experiences that affect engagement, time on site, ad impressions, and more. Taking a closer look at user intent and user engagement could help publishers deliver better experiences, prevent the dilution of ad impressions (driving up their value), and improve visitor satisfaction (time per pageview); which seems to have a strong correlation with organic search improvements. Navigation bounces give publishers a more detailed way of looking at how visitors are interacting with a site, and are a more advanced way of looking at bounce rates. Furthermore, navigation bounces are much harder to manipulate and game than traditional bounce rates. For example, if you have a website that takes publishers to another page automatically once they scroll to the bottom of the page or swipe to the left or right, this will dramatically lower bounce rates, but it may not be what the user wants, and could be negatively affecting their experience, your search rankings, and your bottom line. This is a case where bounce rates could be manipulated to so that UX appears to be improving when in fact it isn’t and is likely causing long term damage to the publisher (view our case study on this). At Ezoic, we integrate with thousands and thousands of websites to help them test and deliver better experiences to visitors. Because of this, we have unprecedented data and access to user behavior data that few others have. To measure navigation bounces we keep track of the whenever a user loads a page and the timestamp at which they load the page. The timestamp that’s recorded is what we use for determining if the user is a return visitor or not. For navigation bounces, whenever we get a request for a page, we are able to get the timestamp of the request and compare it with the timestamp of the user’s last load time. Our system uses the two timestamps and determines if it is a navigation bounce or not. If the request (for the page) timestamp is very close to the user’s last page load time, we log it as navigation bounce. If you want to start digging into navigation bounce rates using Google Analytics you need to look at navigation paths in analytics and/or look for pages with the same previous page and next page. To look at navigation paths, and possible bounce rate increases and decreases, go into Google Analytics and navigate to Behavior. Then, go to Site Content > All Pages. Now select the Navigation Summary tab on the chart. At the bottom, start selecting the URL’s that you would like to begin exploring by date range. Click on a URL and you should now be able to see the previous page and the next path page. Now, at the top — where it says pageviews — select vs. Time on Page to see which pages are having very low numbers here. The smoking gun for problems with navigation bounces here is to see the majority of previous path and next path pages being the exact same URL for URL’s you decide to zoom in on. Lastly, you can also monitor this by looking at Behavior > Users Flow. Again, select Pageviews vs. Time on Page and look closely at which pages may be only having very low numbers here. You can also see in the chart above how these things may be spiking or declining if you’ve recently changed something that has positively or negatively affected this. What you’re looking for is inconsistency. Why measure and optimize for this metric? While UX metrics like time on site, bounce rate, and page views per visit are universally agreed upon and widely used, they often fail to reflect a how engaged users are and their intended behavior when browsing a site. Metrics like navigation bounce, provide a greater and more detailed look at what a user is actually doing when they visit a publisher’s website. Consider this, if a website visitor lands on an article, then subsequently views another page, only to immediately return to the original article, what does that tell us about that second pageview? It tells us that is was unwanted in some shape or fashion from that visitor (accidental, not what they were looking for, etc.). This behavior is indicative of a bad experience. 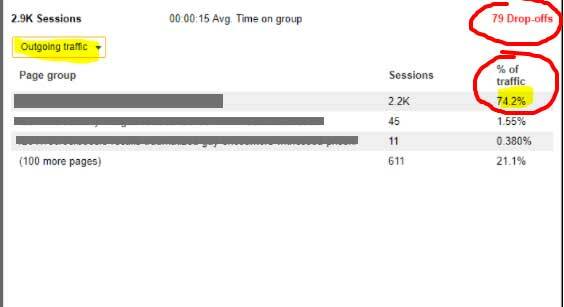 Actual engagement time for this user is likely very low (read more about the impact of “engagement time” here). Most publishers generally want to provide visitors with great experiences for dozens of reasons —branding, organic search algorithm preference, etc — lowering navigation bounces are a direct way of improving user experiences. Navigation bounces are also a direct way of measuring specific elements of your site that users may or may not be enjoying. It’s also worth exploring how navigation bounces correlate to your return visitor rate and engaged pagviews per visit; as the latter is directly correlated to higher revenue. If a rise in navigation bounces is directly proportional to a drop in return visitor rate you may need to take a close look at what has changed on your website to cause this. Now let’s consider this, outside of the desire to create better user experiences alone, visitors that are more engaged, visit more pages, and spend longer time on your site are more likely to return in the future and generate more digital revenue overall (studies prove it). However, these metrics can’t be manipulated or gamed. This means generating artificial pageviews and the alike can actually be damaging to all the things publishers are trying to improve. Lastly, publishers that have high navigation bounce rates may be at a high risk of damaging their ad revenue long term. Imagine that certain pages have a very high navigation bounce rate; resulting in poor CTR and viewability for ads on that page. This could dilute the value of these ads over time, and cause even more potentially harmful effects as well. We will touch on these a bit more in the section on revenue below. Recently we had an opportunity to work on a case study with a publisher that had been using the Ezoic system for approximately 6-7 months to test content, layouts, and ads in order to deliver every user individualized experiences. This helped them improve both revenue and organic search performance; as it was extending time on site, increasing, pageviews per visit, and driving down overall bounce rate. Ezoic was also automatically reducing navigation bounces as a part of their optimization on this front. However, the publisher wanted to attempt to further increase their pageviews per visit by leveraging an additional technology on some of their mobile traffic. This changed their mobile layout, allowed users to swipe left or right for additional pageviews, and automatically took visitors to the next page when they scrolled to the bottom. The implementation of this new technology nearly tripled navigation bounce rates on these mobile pages. In many cases, some articles had a navigation bounce rate of over 74%! This resulted in a slow and steady decline in organic search traffic. It was obvious that upon the implementation of the change, that many of the organic keywords this publisher ranked for dropped considerable and continued to decline as these metrics continued. The pages that dropped the most in rankings were those with the highest navigation bounce rates. This is where understanding and measuring navigation bounce becomes extremely valuable in diagnosing these issues. For this site, pageviews per visit were going up and bounce rates were going down, so UX metrics appear to be doing fine — thus they should be improving SEO, not hurting it, right? Unfortunately, these metrics were clearly being artificially inflated by the new layouts and these metrics were being gamed. The visitors weren’t, in fact, having better experiences. This is why manipulating these metrics doesn’t usually equal success. Google Search (and the alike) has had their fair share of experiences dealing with people trying to manipulate and game their algorithms. When giants like Google are measuring overall search satisfaction, it is likely looking at much more than if a visitor went to a second page or didn’t bounce. They are likely looking at the journey as a whole, and when a large number of negative events start occurring quickly, it can have a very poor effect on search engine ranking positions. 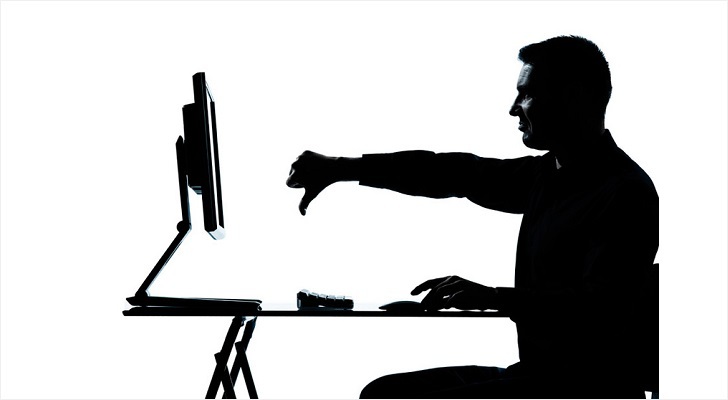 We already know that something that negatively affects user experience could also have a negative impact on revenue. However, navigation bounces also have a very direct relationship with the CPMs and amount of revenue you generate from ads on a page. For example, imagine you have a page with a very high navigation bounce rate. This page is garnering a lot of pageviews, but the engagement, ad CTR, and viewable ad impressions that occur on this page are very low. This badly dilutes the value of this page to advertisers, so over time, advertisers will begin putting much lower bids for ads on this page (and likely this site). Taking it a step further, if this is happening on a large scale on the site, it’s not uncommon for advertisers to blacklist sites that have unacceptable CTR or viewable impression metrics. This means that advertisers will look at websites that their ads are showing on, and choose to exclude their ads from ones that produce CTR and viewable impression metrics below a threshold they have established. Many websites owners may not ever know about this. The website owner will just see their total session revenue (EPMV) decreasing over time and may not understand why their pageviews per visit are going up but total revenue is going down. Measuring navigation bounces are really one of the only ways to safeguard against low-value pageviews that could be driving down your page CPMs and decreasing the value of your site to programmatic advertisers. Understanding when and why these kinds of bounces are occurring on your site can help you both prevent and improve these metrics. If you’re not looking at this data and have a high degree of navigation bounces, it is totally possible you could be falling below advertisers thresholds, and are at risk of being blacklisted from their campaigns. Once this happens there is no going back. One of the most valuable attributes of the navigation bounces metric is that it cannot be inflated or gamed easily. Metrics like pageviews per visit and bounce rate are important, but they can be easily manipulated by technology or clever UX developers. If you really want to optimize how users browse your web property, navigation bounces can give you a compass to uncover true user behavior and visitor intent as they navigate the site. It can help you understand when pageviews per visit are artificially high and bounce rates might be artificially low on certain pages or across the site. 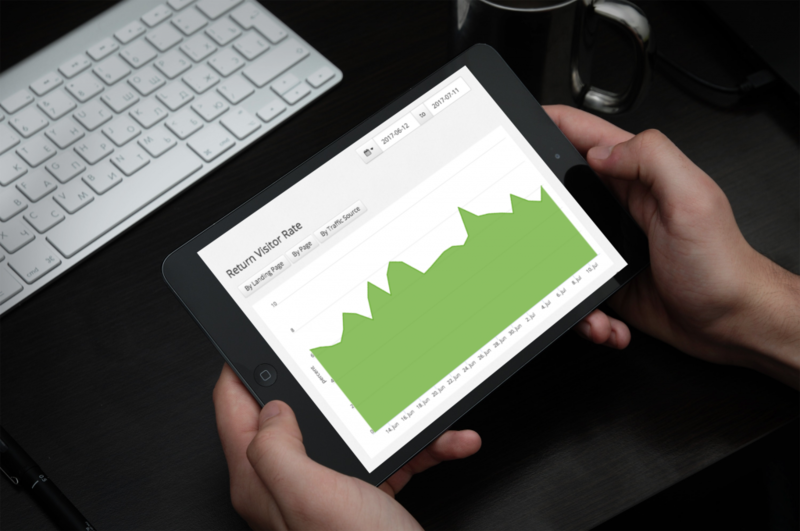 Understanding this metric can help you optimize for higher revenue and better SEO. It can also help you understand what changes may be having a positive or negative effect on visitor behavior; resulting in punishment from search engines and revenue drops from advertisers. Ultimately, this isn’t a hard metric to measure and something every digital publisher that relies on organic search traffic and programmatic advertising should be looking at on a weekly basis. 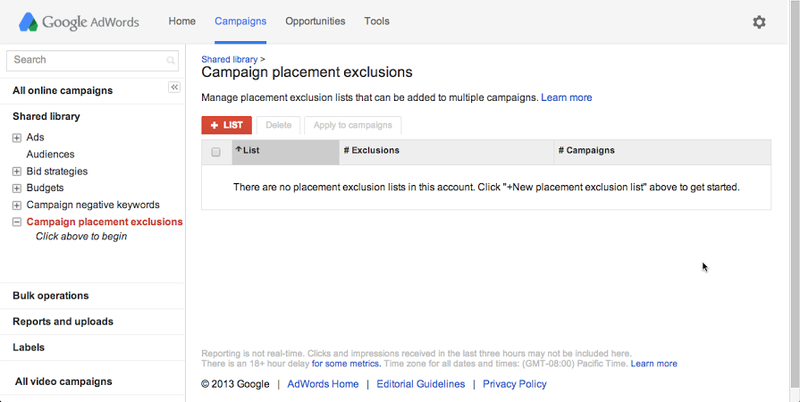 If you’re not currently doing this, the Ezoic platform includes navigation bounce tracking sitewide and by landing page in its advanced reporting dashboard. You can sign up and try it out now. 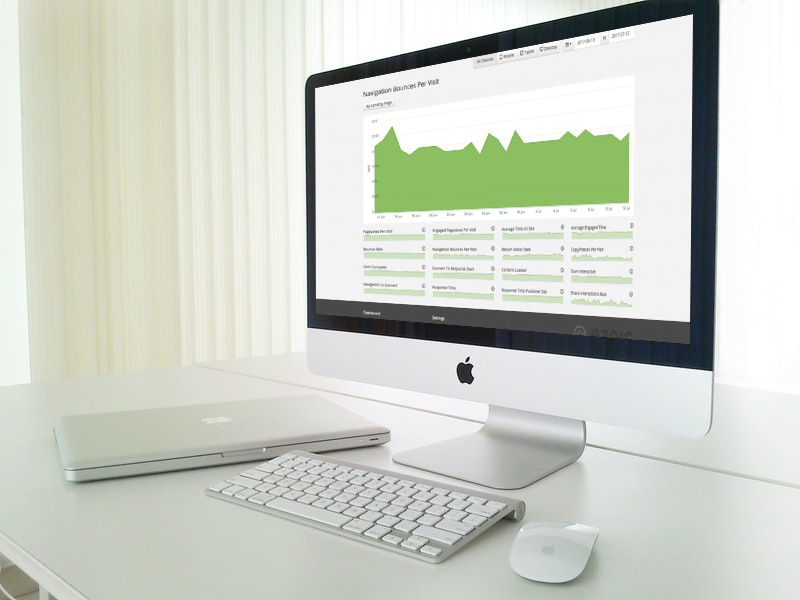 It’s hard to find good quality data like yours about web analytics. I honestly appreciate you guys sharing, thanks. A great article. I’d say that, more often than not, pageviews and the like are completely irrelevant. Better focus on lowering that bounce rate and increasing time spent on page.